From May 8 to November 7, 2004, Cultural Concierge, a neighborhood-based program of DowntownNYC!, "took it to the streets" to drum up audiences for arts institutions, museums and community tourism attractions in Downtown Manhattan, Greenwich Village and the "Near North," including those in Chelsea and Union Square. 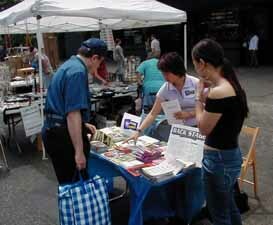 A series of kiosk-based promotions was held in street fairs in the Downtown area, courtesy of Clearview Festival Productions, a promoter of New York street fairs. Each week, friendly and culturally-hip volunteers distributed promotional information on theaters, museums and walking tours in order to assist residents and visitors in planning entertainment activities that are Downtown or "Downtown in Spirit." In August, 2004, this program was transferred out of DowntownNYC! to the stewardship of Barbara Okishoff, DowntownNYC's project manager of this effort, who asked for the opportunity to convert this program into a private commercial undertaking under the management of her arts marketing firm, ArtVoice. The DowntownNYC! team is glad to have participated in launching a new service to the arts that could possibly continue without public support, and we wish Ms. Okishoff the best of luck in her new undertaking. If you have further questions on Cultural Concierge, please contact Barbara Okishoff at: (212) 595-3258.